Sometimes it's a long shot--a very long shot. Sometimes it's a real bad start, maybe even a fall out of the gate. Sometimes it's running a second time in the same week, with only 2 days rest for a Grade 1. Sometimes it's beating a seemingly unbeatable champion. Sometimes it's a come-from-way-behind in the stretch. We had all of those at Saratoga 2012. Some of them we had a few times. Among them, here are my (always humble) picks for Highlights. 5 of them. Come on. Can't help but love this one. Sunday, July 29th. The 5th race, a 6 furlong maiden claiming with a 20K price tag on each filly and mare. One of the fillies had finished 7th and 6th in her first 2 tries, losing by a total of 36+ lengths. But local trainer Gabriel Goodwin and his father-in-law, the owner, Guy LaMotta, still thought she was special. Well, on that Sunday, going off at by far the longest odds in the field of 9, Lady Utopia vindicated their trust. 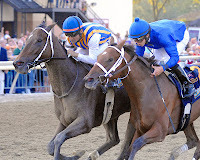 Stalking the dueling leaders, M'lady went wide and passed them both under Abel Lezcano to win convincingly by 2 growing lengths. In the hearts and minds of some who love long shots, as well as her trainer and owner, this beautiful 3 year old girl just might have been the Belle of the Meet. 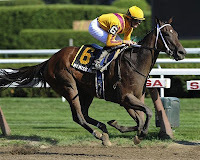 She won her first 2 races at Saratoga, including the Adirondack, then her 3rd at Belmont in the Frizette, and then her 4th at Churchill Downs--a 3 length victory in the Breeders Cup Juvenile Fillies--to cap her 2-year old season in 2011. 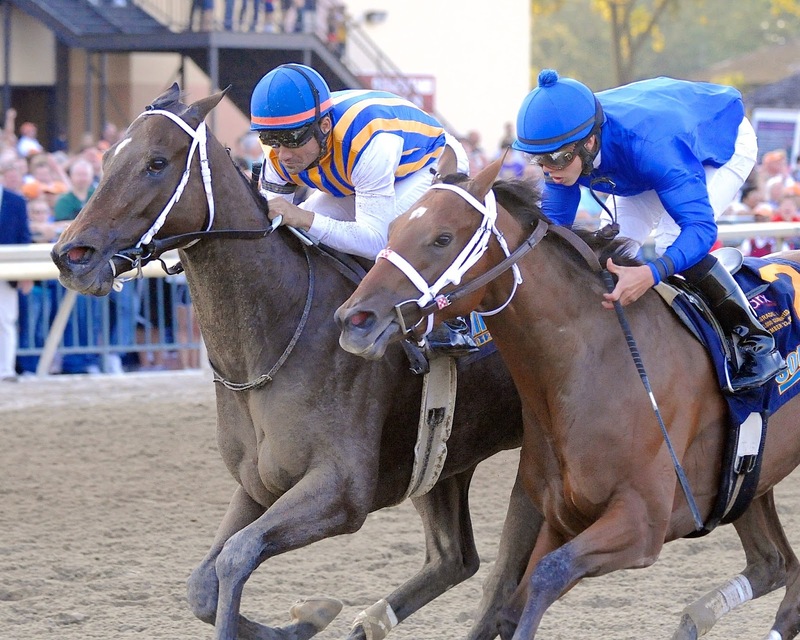 Not surprisingly, she was crowned the juvenile filly champion at the Eclipse Awards. 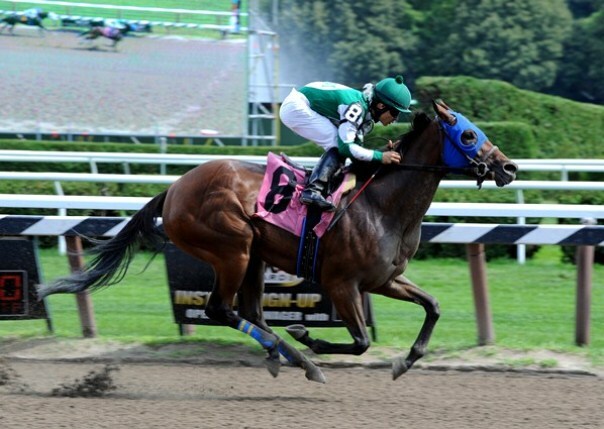 But then a shin injury kept My Miss Aurelia out of competition for 9 months. 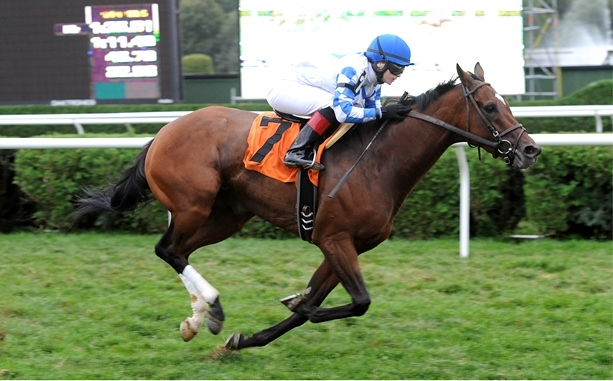 She made her return on August 8, in a mid-week overnight stakes at Saratoga. The 100K Mandy's Gold. The Steve Asmussen trained champ was making her long awaited return to considerable fanfare and anticipation. When the gates opened, however, Aurelia stumbled badly. A front-runner who always raced in the lead or in 2nd, she was now in the rear, having lost several lengths from the fall. But a champ's a champ. Ridden patiently by Julien Leparoux, Aurelia steadily gained on the others, took a wide turn to catch the leader, and in the stretch rolled to another 3 length win. A truly amazing return! From both the 9 month layoff and from the stumble at the gate. Two months earlier, he was claimed for 25K. 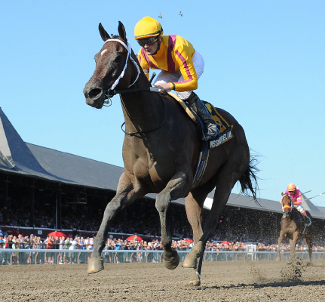 3 days earlier, he ran and won (by 6+ lengths) the Albany Stakes for New York breds, at 1 and 1/8th mile. Now it was his 1st graded stakes. The Grade 1, 7 furlongs King's Bishop for 3 year olds. One of the premiere sprints at any track. In an era when top thoroughbreds--the type that compete in Grade 1's--race once every month or two at best, Willy Beamin was racing in the Bishop after only 2 days of rest. Well, the Rick Dutrow trained gelding apparently didn't get the memo that this was crazy. Under Alan Garcia, Willy stayed near the back of the 10 horse pack until he went wide round the turn. Sixth at the top of the stretch, he passed Trinniberg, Currency Swap, Doctor Chit and Unbridled Note, and then he beat Fort Loudon to the finish line by half a neck. Go Willy! Ain't too many ponies who do or can do that these days. 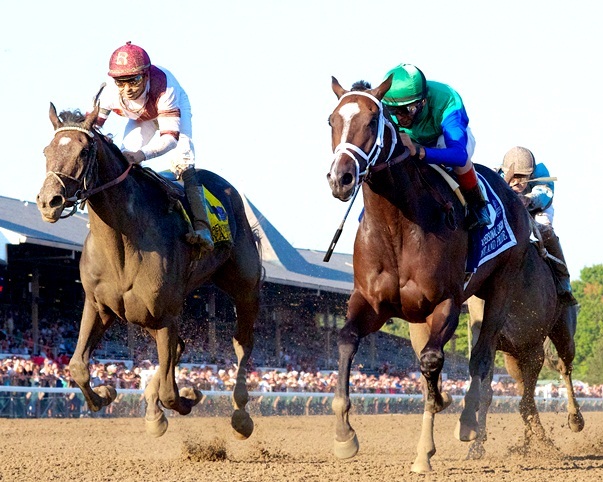 Royal Delta, It's Tricky, and Tiz Miz Sue. Now that's competition. A month earlier, she had finished 4th in the Delaware Handicap. Bested by Royal Delta, Tiz Miz Sue and Awesome Maria. 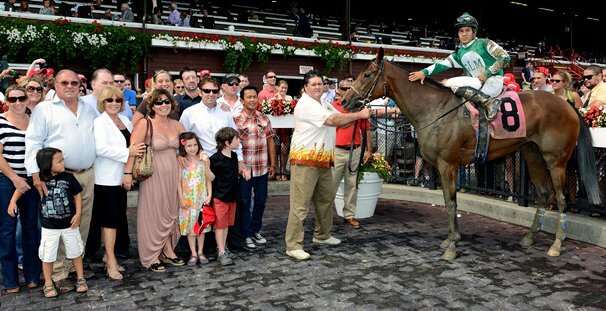 But on this Sunday, day after the Travers, Love and Pride took the gold in the 1 and 1/8th mile Grade 1 for non-juvenile fillies. Together with the Alabama, Saratoga's showcase for the best ladies. At 10 - 1, with Johnny V aboard, the Todd Pletcher trained 4 year old stalked the leader, Brushed by a Star, and then moved to the front in the stretch. She was challenged only by Royal Delta--the 2011 winner of the Alabama, the Breeders Cup Ladies Classic, and the 3 year old Filly Champ, as well as repeat BC Ladies Classic winner and Older Female Champion for 2012. But no one told Love and Pride she couldn't win. So she held out and proved she could beat the best. 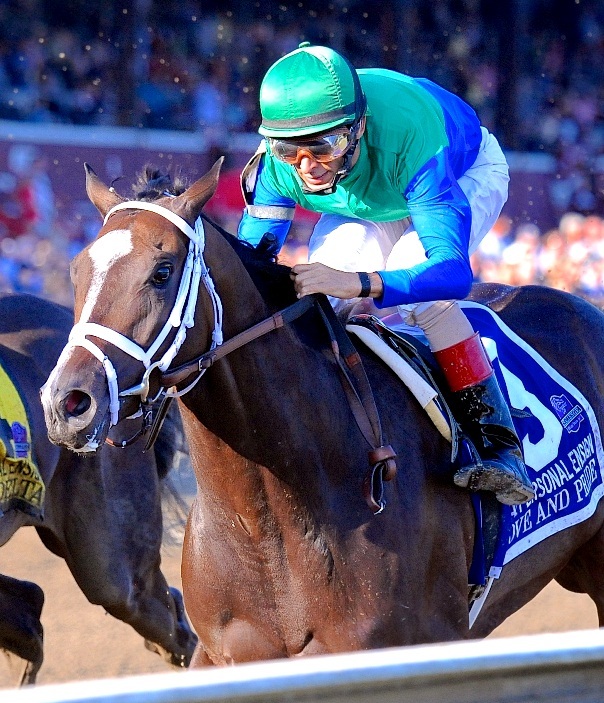 As Blood-Horse magazine headlined: Love and Pride Stuns Royal Delta in 'Ensign. Once more, Saratoga, the Graveyard of Champions. And creator of other champions--as Love and Pride was that day. 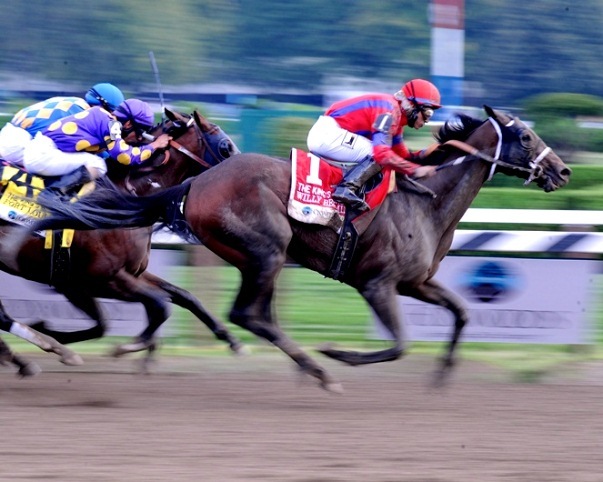 OK, it's the last race of the last day of the Saratoga 2012 meet. Sad. They're not even playing Sinatra's Summer Wind! So here's the last race. Rosie Napravnik won the meet's 1st race and just won the Hopeful this day on Shanghai Bobby, and lots of us are big fans. 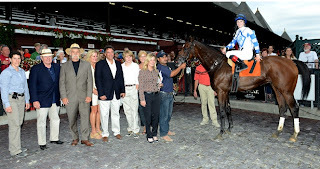 She's on a 5 year old gelding trained and owned by Linda Rice. [Lots of fans there too.] Poor guy hasn't won yet in 8 races. Not one of the low level maiden claimings he's been running. Now here's another one. He's the betters' 4th choice. But it's Rosie and Linda and, it turns out, there's lots of us at the rail who've placed our hopes and coin on Golden Tornado. Well, well, well. Tornado is 10th out of 10 heading into the turn. Could he be more dreadful? But then, but then. Rosie swung him out 7 wide and he came to life. Seventh in the stretch, he began to pick up speed and pick off horses. Flying by the others, his kick in the final 16th or so was something to behold. Like a freight train. 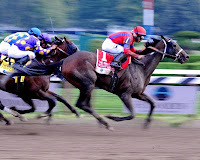 He blew past all of them like they were loping, and he finished pulling away even farther for a 3 length, super-stunning victory. 10th to 1st, way wide, a veritable tornado down the stretch! Rosie & Linda & Co. The fans at the rail--family, friends, strangers (including a guy from Long Island whose daughter's name is Rosie)--were screaming and high-fiving like "our" horse had just won the Derby. 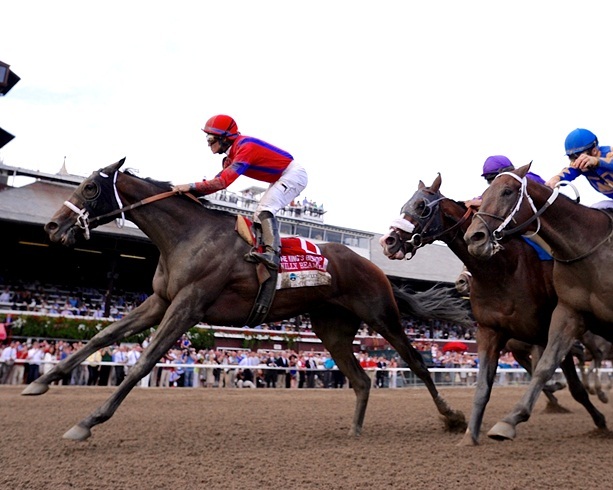 A GREAT, fabulously thrilling finish to the summer at Saratoga. 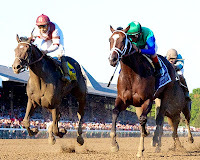 In the next and final post in our Saratoga Highlights--2012 series, we'll shift from the thoroughbreds to look at a few of the humans who stood out this past season.